Real-time WYSIWYG editor: customize the look of your website directly on page and see your changes right away - what you see is what you get! Increase wordpress theme features minimal design that will be friendly to all possible customization you might want to apply. Theme offers super flexibility for color editing and easily turns from a minimalistic style theme into a juicy website with great animation effects. All the customization is playfully easy, reminds more of a game rather than website setup. 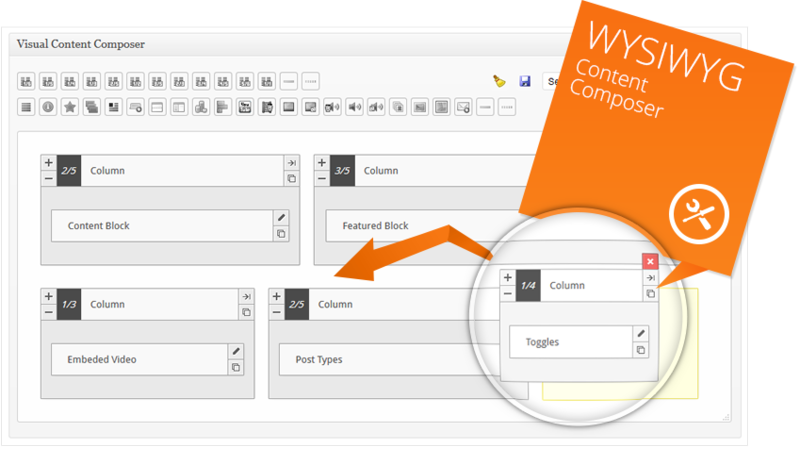 Drag’n’drop content parts across your page with a handy WYSIWYG Content Composer, as well as easily edit their appearance, insert featured blocks, sliders, tables, various media etc. with one click. Create your custom pre-saved layout templates to use them over and over again. It is intuitive to use even for an amateur. All the customization is playfully easy, reminds more of a game rather than website setup. Hassle-free SEO with Increase wordpress theme. When code is clean and optimized to the most up-to-date SEO requirements, getting to the top of the SERPs turns out to be much easier to achieve. The new admin provides handy formatting for breadcrumbs, seo titles and descriptions, easy sitemap. All the customization is playfully easy, reminds more of a game rather than website setup.